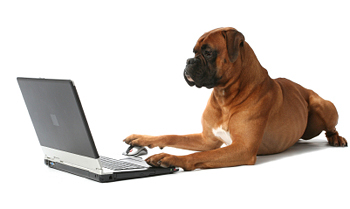 Even a dog understands that most people won’t wait around to see a website that loads too slowly. If you remember the days when you had to dial into the internet using a modem, and the beeps and crackling sounds that indicated you’d established an Internet connection, then you should also remember how unbearably slow it was back then. Today most of us enjoy faster Internet connections than ever before, especially those of us who work on the Web. I don’t mind paying a premium for a super-fast connection because I spend a lot of time online, and I don’t just want to download videos and images quickly, I need to be able to upload data fast, as well. But even as Internet download speeds get faster for those of us who work on the web, online connections remain painfully slow for far too many of the people who may visit the sites we build. High bandwidth connections in the US are increasingly popular, but don’t forget that a growing number of people now access the web via mobile phones, and those connection speeds are still a lot slower than the types of connections you can get in your home or office. When you’re developing a website, don’t let your fast internet connection be the only way you test the download speed of your web pages. Test your pages on your own mobile phone, and consider using a website testing service, such a Google’s PageSpeed Insights. Testing the speed of your site is especially important if your site uses a lot of graphics, videos, or other multimedia, which take longer to download than text and optimized web images. That said, if you’re working online and still suffering from a slow Internet connection, it’s time to upgrade. And no matter how fast your connection may be… never forget that not everyone will see your page load as quickly as you do, and always, always test the load speed of your pages at low bandwidth connection speeds.